Camassia Cusickii also known as Wild Hyacinth have tapering spikes of heavenly blue florets adorn these easy going plants. In USDA zones 5-7, they will not need to be lifted during dormancy. Plant them in well-drained soil in a full sun position. perennials, both in borders and among ground covers. Camassia are native to North America. A genus of only 5 species, they have long, narrow leaves and the Cusickii variety has blue starry flowers. 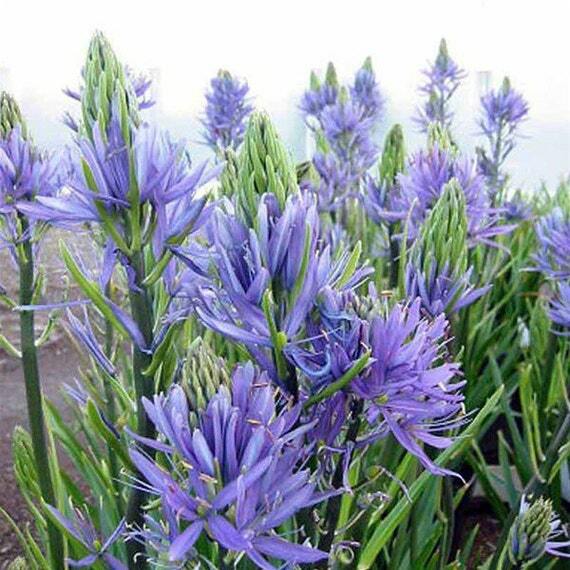 Although you can't tell by its name, camassia are members of the hyacinth family. They make make large clumps that flower freely in early summer and are quite hardy. They don't require a hot, dry, dormant period in summer like many other bulbous plants. They thrive in moist soils and can be treated much like border perennials. 1. In the Fall, choose a spot that is mostly sunny or has only partial shade. 2. Planting camassia bulbs is fairly simple. Bulbs look much like a small onion, with wiry roots growing out of one site and a spike on the other. Plant with the roots pointing down and the spike pointing up. 4. Follow the rule of thumb of planting bulbs that bulbs need at least 2 times their height of soil above them. Dig a 4-5 inch hole, drop the bulb into it and cover with soil. 5. Regarding spacing between bulbs, if planting in beds, leave approx 8-10 inches between each bulb. If you are planting in containers, you can cluster them a little closer together. 5. After planting, water well so that the soil above the bulbs settles. 6. Camassia bulbs will flower in the early summer. After the flowers die down, the plant can enjoy a warmer rest period. You don't have to water too much during this rest period. Leaves will also die back and at this point, you can choose to tidy up the plant and remove the old leaves or just let nature take its own course.